I’m gonna win the Lottery – Come a little closer and I’ll tell you how. Do you dream of winning the lottery and what you will do with the money? Once you’ve paid off the mortgage, gone on the biggest holiday ever and bought a ridiculous amount of expensive bags, you dream of being this secret philanthropist (Took me ages to work out how to spell that and don’t even ask me to say it!). Blessing your community and friends without them knowing. Okay, maybe the last bit’s just me. But we all dream of life with huge amounts of money. I love asking this question of people as I love hearing the unusual things people want to do or will do. This weekend I bought my last lottery ticket. I didn’t win. I totally expect to win and I’m devastated when I don’t. Needless to say I’ve entered about 10 times in my whole life because it’s too traumatic! My handsome hubby tells me that I have more chance of being bitten by a shark and dying from it, than winning the lottery! And he wonders why I hate swimming in the sea! This aside I have full intention of winning the lottery – My Lottery! And you can win too. You can win your lottery. If I won the lottery (sorry I’m at it again I can’t help it I’m obsessed) I’d walk into this rich life I never lifted a finger for. Once I realised I had a dream that could become a reality I wanted that and not the lottery win. I want to build something. You can look at all you have achieved and feel proud of yourself and your kingdom. You can do it. You will win. I fully intend to pay off our mortgage, have dream holidays and much more. So, tonight with your partner, or dog or whoever will believe you. Write down your lottery winning list. Hunky hubster and I did our dream list one night. Amongst other things, I wanted a house full of Ercol furniture and he wanted a fast car!! Keep looking at your list and keep believing that you can do it. Let it inspire you to shape a life for yourself that you will be proud of. Stick with me and you’ll work out how soon enough, if you haven’t already. 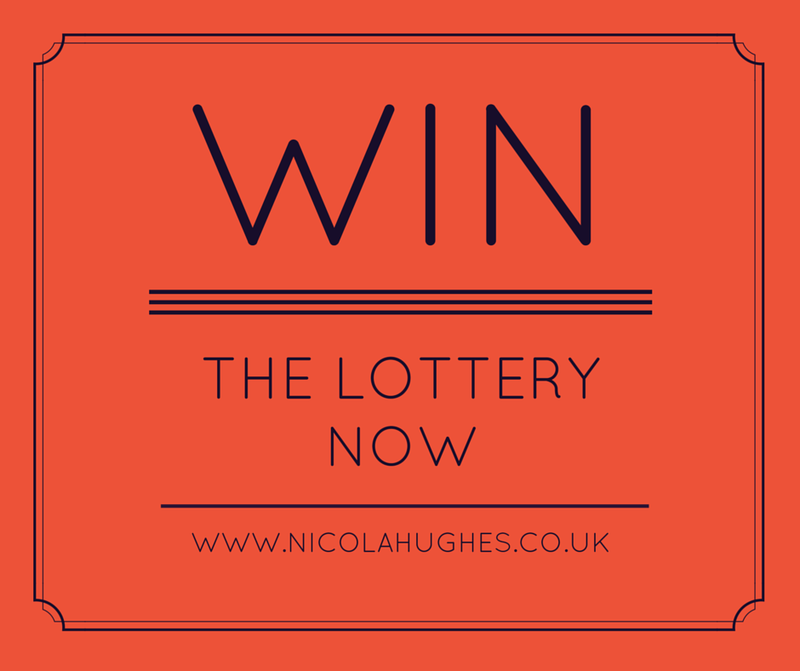 Join the community of like minded women at: www.facebook.com/nicolahughescoaching and tell us what is on your Lottery List because we believe you will get it. If you think this will resonate with any of your lovely friends please pass it on and send them to my FB page.